Like most children of the ’80s, I love me some Ninja Turtles. My fondness for these four green guys has only grown as I’ve gotten older, and they’ve continued to be interpreted by different writers, artists, animators, etc. They’re not quite as renowned in the 21st century as they used to be, but the boys in green still have a legacy that’s very, very special. The next chapter in that legacy is IDW Publishing’s new Teenage Mutant Ninja Turtles ongoing, which is overseen by TMNT co-creator Kevin Eastman. It marks Eastman’s first involvement with the franchise in a number of years, as he sold all his rights to the franchise to his co-creator Peter Laird in 2000. 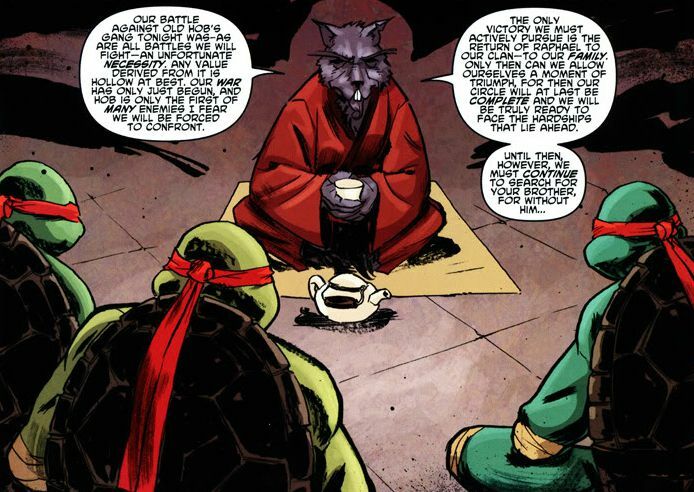 The series has tweaked the Turtles’ status quo a bit, but for the most part the characters still ring true. The big twist for this new series is that Raphael has been separated from Leonardo, Michelangelo, Donatello and Splinter since the accident that turned them into humanoid mutants. Moments after they were all doused in radioactive ooze (per the classic origin story), a cat leapt in and snatched Raph from the group. Splinter is bound and determined to find his lost surrogate son. Meanwhile, Raphael has been wandering homeless through the streets. Nevertheless, his sense of morality is intact. He comes across a father attacking his teenage son, and saves the day. The young man’s name is Casey Jones (sound familiar?) and the two strike up a fast friendship. Our villain here is Old Hob, the mutated version of the cat who swiped Raphael. 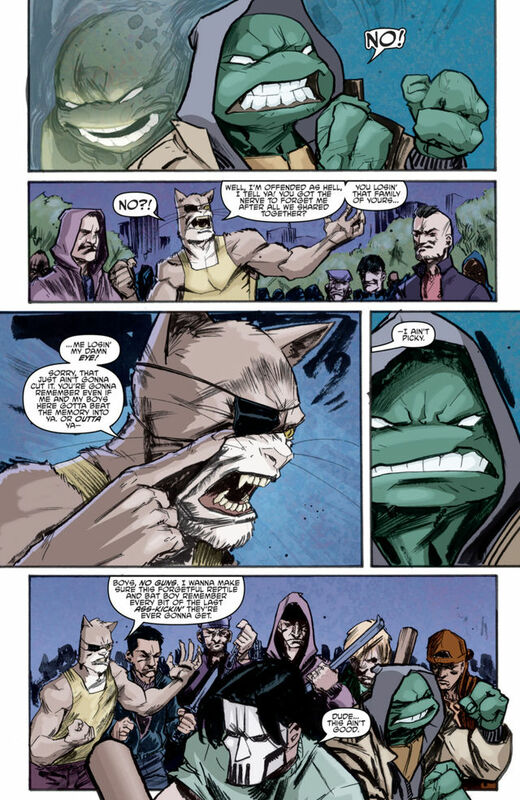 Somehow, this humanoid cat with an eye patch started a street gang, and has been feuding with the Turtles and Splinter since their mutation. I’m not completely sold on this Raphael thing yet. These first four issues did a nice job of setting everything up, but the true test will lay with what Eastman and this team do with this new angle as time goes on. Raphael has always been the hot-headed rebel of the group, and this separation story is an interesting way to set him up as such. Because he’s been away from Splinter and the others his whole life, Raph has never received the training his brothers have. Thus, he could potentially stand out like a sore thumb when he inevitably is placed with his brothers. If this new dynamic can be capitalized on, it could make for some really cool stories. TMNT purists will scoff at this, but I’m disappointed the Turtles kept their red bandanas for this series, as opposed to going with the color scheme they typically have in TV shows and movies. Yes, when the Turtles were created they all had red bandanas. But the problem I’ve always had with that setup is that it can be difficult to tell them apart. If you take the weapons and the dialogue away, and stand them up side by side, you should ideally still be able to tell who is who. That’s not the case here. The fact that this is a full-color book as opposed to black-and-white, which the Turtles were always published in back at Mirage Studios, makes this choice even less sensical. Conspicuous by his absence in this story is the Turtles’ arch nemesis, The Shredder, though there is one scene that features a sword-bearing ninja who may turn out to be him. We also see a shadow-shrouded villain named General Krang, who shares a name with one of the main TMNT villains from the ’80s animated show. April O’Neil and Baxter Stockman also play major roles. Dan Dunan’s pencils are a strong selling point for this series. He’s great with injecting emotion into his art, which I love. During the scene where the un-mutated Raphael gets snatched away from Splinter and the others, surrogate father and son lock eyes, and we can see the fear and desperation between them. He’s also great at working with the Turtle faces, which there’s certainly something to be said for, as they obviously don’t exist in the real world. For a few years now, I’ve been craving a Ninja Turtles series that takes the best ingredients from just about every version of the TMNT, and brings it all together to create something that adds on to classic elements, while still keeping things fresh with vibrant storytelling and stunning visuals. This series seems like it has the right attitude to pull that off. Will it happen? Probably not. That’s a pretty high standard to set for any book. But the Turtles deserve no less, so I’ll hold out a bit of hope. Image 1 from turtlepedia.wikia.com. Image 2 from comixology.com. Image 3 from dreamwidth.org. This entry was posted in Comic Books/Graphic Novels and tagged Casey Jones, comic books, comics, Dan Duncan, Donatello (TMNT), Kevin Eastman, Leonardo (TMNT), Master Splinter, Michelangelo, Ninja Turtles, Old Hob, Raphael (TMNT), Rob Siebert, Teenage Mutant Ninja Turtles, Teenage Mutant Ninja Turtles (IDW), Teenage Mutant Ninja Turtles Vol. 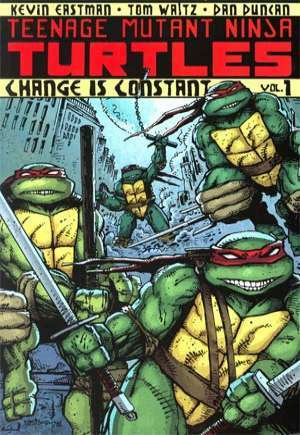 1: Change is Constant, TMNT, Tom Waltz, trade paperback, trade paperback reviews on 02/28/2012 by primaryignition.